Cycling rates tend to be higher near the city center. Such bike-friendly neighborhoods are usually located within close cycling distance of university classes and downtown jobs and feature a mixture of residential and commercial land uses. For example, the bike mode share exceeds 10% in several of the central neighborhoods of both Toronto and Vancouver compared to less than 1 percent in most of their outlying residential districts. (City Cycling, John Pucher). One of the myths used to explain Auckland’s abysmally low levels of cycling is that it is “too hilly”. This doesn’t seem to be a significant barrier to cities like Seattle and Portland with similar terrain (and climates) but higher levels of cycling mode share (4.1%, and 6.1% respectively). I find getting around town is fine with a 7-gear bike, especially since I stick to the ridgelines. There are situations when terrain does become a factor in Auckland especially in the center of the CBD around midtown and the inner-west side. Since there are so many jobs and destinations here it’s a massive opportunity to grow bike mode share, and more importantly to provide useful connections from places to destinations. According to the 2013 census there are over 90,000 jobs within the motorway noose. It would seem easy enough to improve connections to the city-fringe since there are so few left due to motorway severance. This post considers connecting the CBD to the city-fringe West and South. From a network (and low hanging fruit) perspective I consider the above routes as required connections to support cycling (and walking) trips. The following is a comparison and discussion of the elevation profiles of these routes. Elevation comparison out of the Auckland CBD. The cbd-west connections to Ponsonby Road are both long, steep, but steady climbs. Franklin Road seems marginally better, but I would guess both are well used routes. Queen Street seems to be a real challenge uphill though friends tell me they use it. Interestingly it may have more utility as a one-way bike route into the CBD since it will soon connect-up with the new Grafton Gully cycleway. (Using the term connect-up loosely here). Greys Avenue is also quite steep but has a nice connection from Aotea Square and beyond from places like Rutland Street and AUT. Vincent and Hobson seem to be gentler grades than Greys Ave, though depending on the trip origination may require a bit of a climb to get to that elevation. Of course navigating Hobson Street currently is a nightmare. The Union/Pitt route has a long but gentle slope which can be relatively comfortable when using the footpaths. Because it is mostly one-sided along the motorway edge this route has some interesting appeal for its potential to serve as a separated south-north connection from K Road to Victoria Park. Because it is one-sided however, also means that it doesn’t serve a very rich catchment along the way. Interestingly all these routes combine on Pitt Street leading up to K Rd. It is clear that improvements to this small segment would serve a bunch of routes and help to wind back lingering motorway-scaled setting. After a long day of work or a few beers, I would say that many of these routes may not be the most appealing way home, and as I said, I tend to avoid the Aotea area of town especially if my next destination is K Rd, GNR or Ponsonby Rd. 1. Outfit the City Link bus with bike racks so that people near Aotea can get lifted out of the basin to K Road. Two bike racks will not serve a regular amount of people expecting to use such as service, but it will help to support a growing population of people who may need to use such a service irregularly for example when it starts raining or in the event of a flat tire. I can hear the mono-modal whinging already. This will add boarding delays; insufferable boarding delays. Currently the City Link is a real dog along Queen Street. I’m not suggesting that this is ideal or should always be the case, but that there is an opportunity here (bike racks) to deliver wider transportation outcomes, specifically by serving as a sort of cycling escalator out of the CBD. In the longer term there will be increased cycling demand created by the Grafton Gully cycleway, Westhaven promenade, Skypath, and waterfront improvements. Bike racks on the City Link are inevitable and perhaps with rear door boarding and other bus lane priorities this could be implemented in a period of time that actually improves reliability and shortens overall trip travel time for City Link users. 2. The other reasonable option I see is to provide secure overnight bike parking near Aotea. This would allow people to avoid the short and steep trip out of the CBD until the timing is better or perhaps when the next destination is along a shallower incline. HOP enabled bike cages could be placed in the AT car park under Aotea Square. For a bit of fun, here is a more fanciful solution to the elevation problem from Trondheim Norway as recently profiled in Atlantic Cities. This mechanised lift carries paying riders 130m and an elevation of 25m (compare to the steepest bit of Queen St at 375m, and 29m). It is apparently the small town’s number one tourist attraction and cities in North America are considering this technology. Park Rd is an important connection to from the east and also has a lot of people who currently battle horrible road conditions to get to from the medical campus and the hospital. There’s a large untapped market here that is currently ignore. Furthermore, whilst the University provided a lot of bike parking during its recent upgrade the hospital on the other hand provided so little in the new parking garage that it’s always full, appears to be no move to remove any parking to provide more space however. Bizarre that a public health oriented institution pays so little attention to enabling an active mode to flourish. From what I hear, Park Rd also serves as key link from Grafton into the CBD when travelling by bike/train combo. Franklin Rd has long been on the cards for cycle lanes, the local board has been pushing this for years, AT and AC council have always refused to fund it. Presumably because it involves removal of car priority and the installation of more crossing opportunities, better footpaths, cycle lanes etc. I’m guessing it would have been funded long ago if the local board had been pushing for the trees to be removed to allow it to be four laned. That would have been in the plans for the ‘upgrade’ but the cycle lane would be downgraded right at the end to a shared path due to lack of funds. At least there wouldn’t be all those pesky leaves to collect in autumn. I’m sure the reductions in OPEX due to fewer blocked drains and leaf cleaning would have figured prominently in any analysis. That would be (unfortunately yet more) urban vandalism of the lowest sort. Wearing my elected rep hat, yes, Franklin Rd is long over due for some upgrading. Oks, here’s the story. Previous Auckland City Council recognised that Franklin Rd needed upgrading, and started investigations. This was overtaken by the super city. The investigation was picked up by AT which found that the road would need serious money, and careful logistics on account of the services underground and tree roots. The idea was put in the ‘too hard’ basket (needs money, and needs a cat herder to herd Watercare, Chorus, Telecom, Vector etc to do infrastructure upgrades). As a regular cyclist on this road from time to time I asked AT if they would at the very least resurface the road top (it is in shocking condition, particularly if you are going downhill). AT was caught in a catch 22 – the design never officially went away (it was still in the ‘too hard’ basket) so they couldn’t justify repaving the surface just in case money/motivation was found for a complete upgrade. Gah. But word came down from on high that AT needs to essentially decide either way – do it or not do it at all. It has been decided to upgrade, and money is currently being allocated to investigations/design. And the trees are remaining, rest assured. Removing said hat. I used to always cycle along Napier St and Hepburn St parallel to Franklin Rd instead. Quieter and safer. It was the only big hill on my ride from Britomart to Avondale via the cycleway, in fact. Napier street is much nicer. Could a more cycle friendly route be built through Western Park? It would be nice during the day. Western Park is very steep too, and at the bottom you can only climb back to Franklin anyway, or attempt to cross Wellington and Union Sts. You are certainly right about Western Park being steep, but I guess you could criss-cross it a bit. The grade up the right hand side isn’t as bad as the left. At the bottom, you can use Napier street as Bob does which is gentle grade to Franklin. You used to be able to get through to Wilkins street and directly to the birdcage (Vic Park) but that has been cut off. 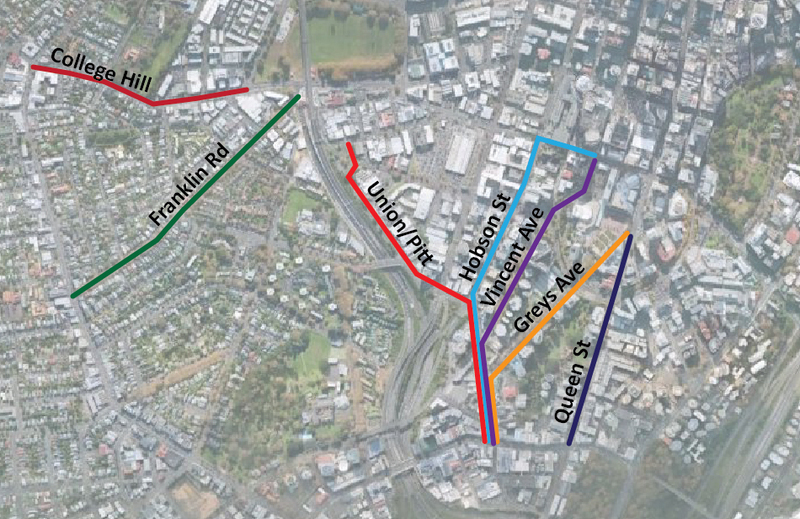 Off subject, but is there any detail around how the Northwestern Cycleway will connect with the Grafton Gully cycleway? The last I heard the plan was for cyclists to go across the Upper Queen Street bridge from the end of the existing NW cycleway, cross Upper Queen Street where it dips down after the bridge, and then carry on from there. Anyone with more updated knowledge on this? A traffic lane and parking will be removed from the Upper Queen Street motorway overbridge to allow for high quality cycle lanes, from what I’ve read nothing will happen to the area next to Ian McKinnon Drive. I don’t get it. What cycle lanes? Bikes on buses have worked really well in Chch. I used them a lot and there was minimum delay for other passengers. It is really quick to put on and take off the bikes. You do need to be strong enough to lift the bike on and off (though the nice Chch bus drivers would help I am sure). The City Link would be a great place to start. And I have to make a plug for electric bikes. The best thing ever for taking the sting out of hills. I am 39 and fiot but the electric bike means I cycle more and cycle further. And if your machoism means you see it as “cheating” you can always turn off the pedal assist on the motor and just use it on the hills. Cycling isnt about exercise, it is about transport. Over the years my daily commute has included the steep section of queen st, franklin rd and pitt st. I don‘t use pitt st any more, its not safe enough, so i go via hopetoun and hereford instead. Hereford is quite steep. Park-and-ride — multi-modal journeys don’t require massive exertion on a bike; park it and skip the hard parts using public transit for longer or difficult journey legs. Bike share — if mixing with public transit, at some point you’ll want to get around somewhere (like the CBD) but you’ll have no bike. Bike share systems are shown to work for this kind of thing. Bikes on buses — where trains don’t go, buses might, though bus bike racks don’t scale up for high loads like train carriages can. Folding bikes — to make it easier on PT services, and to be able to flexibly choose a bus or a train (or a friend’s car! ), a folding bike can work, especially if your bike sections are short/slow; can help with storage too. Electric-assist bikes — echoing goosoid, “Cycling isnt about exercise, it is about transport”; e-bikes can be a good choice for anyone, or the only choice for many aging folks and some partly mobility-impaired users. Improving adjacent factors — if not your bike, it could be the rest of the trip’s infrastructure is letting you down, adding traffic stress or endangering safety, and the cumulative effect puts you off climbing a hill; separated cycleways, civilized intersections, sensible networks with good street-level access and parking, may all ease enough other worries as to make dealing with a few hills worthwhile. Ride slowly — when enough of the built environment is changed to suit a casual riding style, cycling slowly up a hill could be no different in difficulty to cycling slowly flat ground or gently coasting down the other side; steaming ahead furiously isn’t for everyone (possibly not even most people). Part-time biking — don’t bike the hard parts everyday; use other modes if available, especially PT; it might just make the extra effort tolerable over time. Getting fit — if you are sufficiently privileged with the ability to do it, perhaps exercise and get fit enough to more easily deal with the hills in your way. Easier, indirect routes — sometimes there can be a longer but slower or scenic route as an alternative, which is useful to some people under the right circumstances. Small tunnels/bridges/underpasses/overpasses — an easier but more direct alternative route in concentrated form can be created in some conditions in the form of a built structure that keeps paths more level, enabling through passage for those who want it. Earthworks to ease grade — not uncommon in transport engineering for roads to benefit cars and trucks; when cycling is taken seriously, it can be a worthwhile option occasionally (though harder to do in densely built-up spaces). Land-use planning to refactor journeys — over the medium to long term, the single biggest determinant of journey shape and scale is land use; planning this properly will help enable both human scale and transit-oriented travel, and therefore make cycling more obvious choice for more people. Abandon motordom — injudiciously expanding highways, stroads, greenfields sprawl and other disasters of urban form at the same time is counterproductive, often outpacing any progress; better to just not sever an existing or planned neighbourhood with a depressed or elevated motorway, than to do so and mitigate the impact with a token walking/cycling bridge/underpass. This is a great list. I hope your crystal ball is working. Mechanised lifts/elevators/funiculars — besides “landscape attenuators” like bridges, tunnels, and trains, other fixed infrastructure can include bike lifts (as in the original post), cable cars or plain old elevators (useful at PT stations). 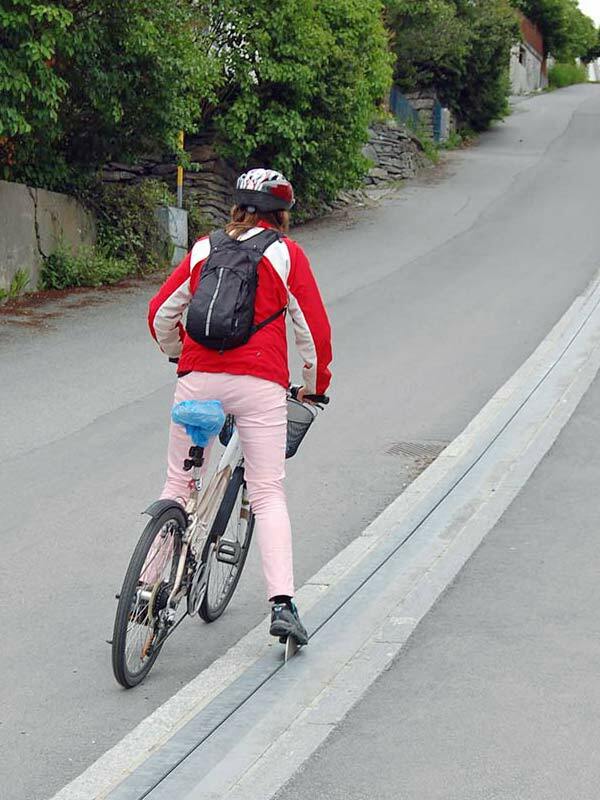 Walking — get off and push the bike uphill with no shame; if cycling is “like walking, only faster”, then walking a bike uphill is “like walking, only the same”; also, infrastructure in the way of ramps, stairs with bike channels, etc. can help. Thanks Non Motorist for pointing out bike share as a solution. A recent survey of riders on the Waterfront Auckland bikes said there was enough cycle lanes, also that more bikes and rental stations would mean they use them more. Disclaimer: Written by Nextbike NZ director. Kent, look closer to home for an example – in Napier/Hastings, the cycling mode share is 12%. Are there a lot of hills in Napier (57,000) and Hastings (75,000)? Geoff, where did you get 12% from? Napier/Hastings had 4% cycle commuting in 2006; there’s been a slight increase in Model Community Hastings since then but not 200%. And generally they’re mostly flat (although there is Napier/Hospital Hill and rolling country around Havelock Nth) and they’re a helluva lot drier/sunnier. Point taken about terrain/weather, but 12% is still very high by anyone’s standards. Auckland should send a contingent to Hastings to see how it’s done. There seems to be a discrepancy between that and other data sources. Regardless those figures are still much better than Auckland which in the MoT data has 1% for trips to work, 0% for the 5-12 year olds and 3% for the 13-18 group. “Since the start of data collection on model communities investment began, cycling mode share has increased from 7% to 12% with walking mode share increasing from 31% to 45%” – OK, those numbers got my BS radar going. They are sourced from work by TDG (see http://conf.hardingconsultants.co.nz/workspace/uploads/makinson-judith-iway-del-532262aa72b57.pdf) and are based on interview surveys of people in Hastings whilst travelling – hence a bias compared to actual overall trips. We know from 2013 Census data that trips to work in Hastings were actually ~5% cycling; school trips are usually higher, but overall trips for all modes are usually lower. No. They should send a contingent to the Netherlands, Copenhagen, Vancouver and New York to find ideas. Could a cycle-way be included as part of the CRL? It wouldn’t be the nicest view and would need plenty off CCTV, but it would be a gentle elevation, and service useful areas. I’d have thought you’d have plenty of room within a circular cross-section tunnel, if that is what the CRL is going to be. No room in the tunnels. Being built just big enough to fit a train through, and why? There are a lot of very wide streets nearby. Interesting. Thanks SB. The reason it occurred to me is that the Waterview tunnel, with its circular bore, has room beneath the road for service access and I wondered if they were going to do the same for the CRL. BTW, one of the routes that doesn’t seem to have been covered in this post is the Nelson Street off-ramp, which would connect near Canada Street, Day Street and (of course) Nelson Street, and then run on a cycleway on Nelson Street. It is already in the planning maps – getting it soon(er) is what is important. It would allow detouring of Pitt Street (and we’d probably still see local cycle levels there rise as well due to the overall improvements to cycling accessibility) anbd give another western route down to the CBD and the waterfront. CAA / Transport Blog post on that project coming in a while. What happens at Nelson St? Presumably something pretty significant would have to be done because it’s currently about the worst place to cycle in the whole city.